Insert a shape and add text to it. Apply the animation effects you want. The following example provides details for each of these steps. On the Home tab, click Shapes > Rectangle, and then click or anywhere on your slide to insert the shape. Ctrl+click the shape, click Edit text, and then type the text you want to animate. In our example, we'll type WOW!. On the slide, select the text. On the Home tab, in the Font group, apply any formatting, such as font settings or colors, that you want. For example, click the arrow next to Font Color to choose a different color. 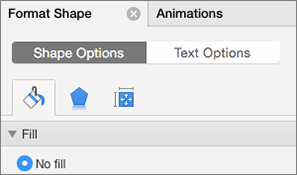 Double-click the shape, and in the properties pane on the right, go to Format Shape > Shape Options. Under Fill, choose No fill. Under Line, choose No line. Now let's add Fly in and Spin animations to the text. Select the shape text and click the Animations tab. Click Fly in in Entrance Effects. (Optional) In the Animations property pane, select each animation step and adjust the Effects options and Timing settings as required. Learn more. To preview the animation, select the first animation and click Play From. On the Home tab, under Insert, click Shape, point to Rectangles, and then select a rectangle. In your presentation, drag the pointer to create a rectangle, and then type the word WOW in the rectangle. On the Home tab, under Font, apply any formatting that you want. For example, click the arrow next to Font Color , and then click a dark color, such as black. Shapes have a fill and line color associated with them. To make the word "WOW" resemble other text, you have to delete the fill and line color. Click the shape's border, and then click the Format tab. A blue border appears around the shape. The shape should look similar to the following illustration. Under Shape Styles, click Fill, and then click No Fill. Under Shape Styles, click Line, and then click No Line. The shape should now have no fill and no line, and should look similar to the following illustration. On the Animations tab, under Emphasis Effects, click Font Color. Under Animation Options, click Reorder, and then under Effect Options, on the Property pop-up menu, click the color that you want to use. To preview all animation effects on the slide, on the Animations tab, under Preview, click Play. Each animation effect is represented on the slide by a number next to the object, which indicates the order that it will play in. If two animation effects are set to play at the same time, they are represented by a numbered stack . You can change other animation options, such as the speed or how the animation starts. For more information, see Change animation order, speed, or how it starts.